Moments before, he had told the crowd exactly what he was feeling as he won the Bassmaster Elite on the Delaware River. Suddenly, “Going Ike” took on a new meaning. When the fishing goes very right and when the fishing goes horribly wrong, Iaconelli is famous for his, um, unrepressed vocal and physical expression. Now, “Going Ike” also means achieving the win of any pro angler’s dreams. 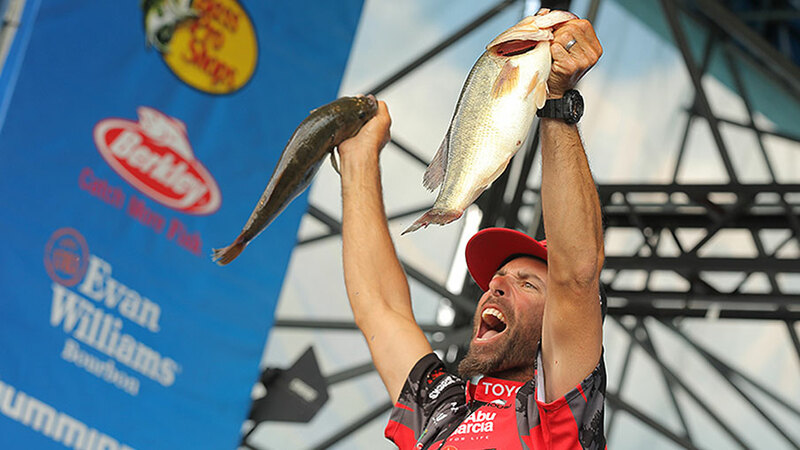 Now living in Pittsgrove, N.J., Iaconelli recovered from a start at 21st place to lead for two days running before triumphing on the fourth and final competition day on the Delaware River, where he learned as a kid what bass fishing was all about. “This is a great feeling to know the Classic is sewn up. Having a Classic berth is a very important thing,” said Iaconelli, who would have had an uphill climb to clinch an entry into the world championship through points earned at each event. His low-tides spots were on what he called “main river hard stuff’: mostly industrial docks on the main river adjacent to large flats. His prime midtide spot was a barge at the mouth of Timber Creek, near where he grew up in New Jersey. His hottest ace was having spots to go to during high tides. The best were big concrete drains that bring water in and out of tidal ponds. The drains, only accessible to a caster in high water, have iron grates, but the bass slip between the bars in search of the ponds’ forage, Iaconelli said. “I made a decision to start on the main river to fish those flats in the low water, and never had a bite,” he said. Iaconelli now has eight Bassmaster wins on his pro resume, which includes another Elite trophy on Alabama’s Lake Guntersville in 2006. He is the only angler in competition history to have claimed three significant titles of the sport: B.A.S.S. Nation Championship (1999), Bassmaster Classic (2003) and Toyota Bassmaster Angler of the Year (2006). The 2012 Classic champion, Chris Lane of Guntersville, Ala., finished in second place with 39-14 to Iaconelli’s’ 47-14. Lane landed the largest bass of the day, a 3-14. Third, fourth and fifth places were taken by Jason Christie of Park Hill, Okla. (39-1); Kevin Short of Mayflower, Ark. (39-0); and Shaw Grigsby of Gainesville, Fla. (36-15). Elite pros competed for points as well as cash on the Delaware River — a path into the Classic and the only road to the Toyota Bassmaster Angler of the Year crown. In the points standings, Greg Hackney of Gonzales, La., uprooted the leader over six consecutive events on the 2014 Elite trail, Mark Davis of Mount Ida, Ark. Davis fell to seventh place. Aaron Martens, the 2013 AOY, became Hackney’s strongest challenger, only one tick behind.